1.Have you troubled why sold soap dispensers that made of low cost Stainless Steel and constantly break down, clog, and leak into your cabinets below on Amazon ? Look no further! Introducing Brass Sink Soap Dispenser by EMBATHER. Yes! Pump Head and Base Assembly Threaded Tube for Thick Deck, Thread flange all made of Brass . 2.Have you troubled when a small hardware was broken ,then the soap dispenser all unused ? That's no problem! we will promise that free exchange any parts within a year,Lifetime warranty for any issues. not only increase the customer guarantee ,but also increase utilization and more flexible; Who else is offering you that kind of warranty ? 3.Have you troubled that you have to pump several times on your soap dispenser to finally get the soap flowing? Don't worried ! The pumps on our soap dispensers are specifically designed to stay primed so they always deliver soap on the very first pump(expect the frist use ). And don't drip. 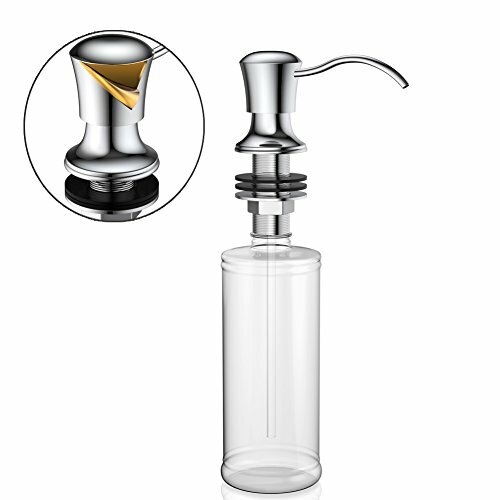 TOP QUALITY PUMP-- Liquid soap dispenser is made out of brass to stand the test of time. Strong, acid-resistance, corrosion-resistance durable and multi-layer finishing process, stunning looks. REFILL FROM THE TOP-- simply remove the dispenser head and refill with liquid soap-you do not have to remove the bottle and No more crawling under the sink! THE PERFECT COMPANION FOR YOUR SINK- Can be repeatedly used to add equipment soap hand sanitizer, shampoo, shower gel, etc. And perfect for any at home cleaning, cooking. Helps reduce germs to prevent common sicknesses and disease. If you have any questions about this product by EMBATHER, contact us by completing and submitting the form below. If you are looking for a specif part number, please include it with your message.